The local police will soon start a highway ambulance scheme in order to provide speedy first-aid to accident victims on highway. According to sources, the police has asked the District Red Cross Society for monetary aid in purchasing ambulances for the purpose. The reduction in STD rates which are applicable from tonight might land the telephone subscribers paying higher rentals. Connect, a private basic telecom operator in Punjab and Chandigarh, which has also announced slashing of STD rates, has requested the Telecom Regulatory Authority of India (TRAI ) to allow the operators to increase the telephone rentals. It was a rather warm day — quite unlike the one which requires bonfires to beat the chill. 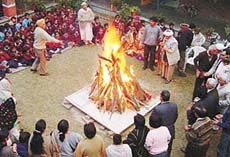 Nevertheless, the spirit of Lohri reigned high despite the winter’s inability to keep its date with the festival. The day was surely not the coldest in January, as it is traditionally meant to be. The imposition of house tax by the Municipal Council here has come up with stiff resistance from most quarters. In spite of the assurances given by the government that the imposition of this tax would be for the benefit of the masses, house owners are up in arms. A large number of book-lovers thronged the National Book Fair at the Circus Grounds in Sector 17 here today on the concluding day of the fair. ‘Ved Shabd’, a collection of all four vedas and the 11 sanghitas, will adorn the stacks of the Central State Library, in Sector 17. The Punjab School Education Board has announced the schedule of the annual examination of Class X to be held from March 6 to 21. Alain Corneau occupies a unique place in French cinema. By himself, he embodies the main genres of cinema: films noirs, detective stories, musicals, historicals, adventure films and comedies. For this very reason, the Ministry of Foreign Affairs, along with the Alliance Francaise, has decided to present a selection of six films by the director. Vijay Giri is a man of many trades. But the best part is that he works to sustain the charm of each trade he enters. Alok Dasgupta, (a well-known name in the Oriental music circle of the USA) gave a memorable sitar recital at the Pracheen Kala Kendra, Sector 35, here at the weekend. Alok was born in Jamshedpur, then in Bihar and now in Jharkhand, took rigorous training, particularly emulating Pandit Nikhil Banerji, the maestro. Alleging callous and indifferent attitude of the medical staff in the PGI’s emergency Ward, Sector 22 resident Ashwani Anand has, in a complaint submitted to the IGP, Mr B S Bassi, demanded that a case of negligence be registered against doctors attending to his relative who died while undergoing treatment. The UT Director, Health Services, Dr Rameshwar Chander, inaugurated a training programme for the medical officers under the national surveillance programme for communicable diseases. The DHS highlighted the prevailing conducive conditions for the outbreak of communicable diseases in the region. Simrandeep Brar, a class XI student of Yadavindra Public School, SAS Nagar, has established himself in cricket circles specifically at school cricket level. Simrandeep has made his school and state proud when he played for Indian schools cricket team in the under-18 section at the just concluded International Schools Cricket Tournament held at Ludhiana.